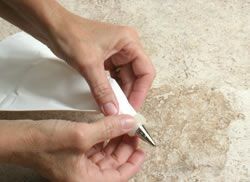 RecipeTips.com's video demonstration, 'Never Use a Dull Knife,' is a reminder to keep your knives sharp. Here is a quick tip from RecipeTips.com. My grandma, Velva, always says, you are more apt to cut yourself with a dull knife than you are with a sharp knife, so always try to keep your knives as sharp as possible. For more great quick tips, visit RecipeTips.com.